Nocturnes . . . in Berkeley? Seven members of The Nocturnes, a collective of night photographers, will be exhibiting our work at The LightRoom in Berkeley. A reception will be held on Saturday, July 19, 2–6 p.m. The public is invited. Tim Baskerville, photographer, educator, and founder of The Nocturnes night photography group, has gathered together a few of who he calls “the usual suspects” to explore, interpret, and reveal the seldom-seen nocturnal beauty of Berkeley and neighboring East Bay locales in an exhibit titled “Nocturnes . . . in Berkeley?” The work of seven artists will be presented at the LightRoom from July 14 through August 22, 2008. The gallery and studio is located at 2263 Fifth St., Berkeley. LightRoom hours are 9 a.m.–6 p.m. weekdays and 10 a.m.–2 p.m. on Saturdays. For more information, you may call the LightRoom at 510-649-8111. 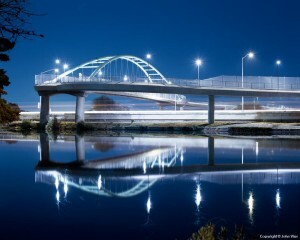 “Nocturnes . . . in Berkeley?” is a night photography exhibit featuring work by artists living, working, teaching, or photographing (or all of the above) around Berkeley and nearby East Bay communities. 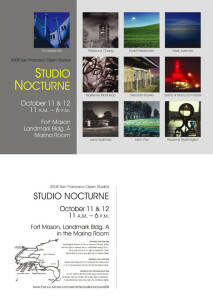 It marks a shift in focus for The Nocturnes group (formerly San Francisco-based) to East Bay and North Bay locales. Established in 1991, The Nocturnes collective has for many years focused on presenting night photography that investigated various San Francisco districts and neighborhoods such as Potrero Hill, the Presidio, Fort Mason Center, and the Embarcadero. It is with great pleasure that some of the more active Nocturnes turn their sights (and camera lenses) toward Berkeley and the greater East Bay. The work of the artists ranges from detailed studies of the industrial West Berkeley neighborhood known as Ocean View by Berkeley photographer John Vias (my Overpass 1 image was chosen to represent the show) to quieter, almost pastoral images done on the UC Berkeley campus by Charity Vargas and Tim Baskerville, and on to waterfront scenes, taken from or looking toward Berkeley, by Mark Jaremko. The artists participating are Tim Baskerville, Denise Fuson, Sherry Glassman, Mark Jaremko, Joe Reifer, Charity Vargas, and John Vias. The title of the exhibit comes, of course, from a long-running ad campaign from the late 1960s by the Berkeley Farms Corporation. The tagline ran: “Farms in Berkeley?” to which one hears a cow respond “Moo-o-o-o.” And, as incongruous as it would seem to find farms in present-day Berkeley (although the Ocean View district was once an agricultural area), it should come as no surprise that The Nocturnes have found beauty, mystery, and transformation amid Berkeley’s darkened streets. This show collects the work of several of my fellow night photographers. This is the first I’ve exhibited in the South Bay, so hey, South Bay people, if you haven’t made it up to San Francisco or the East Bay lately, now until September 7 is your chance to see some night photography close to home. San Mateo’s City Hall is at 330 West 20th Ave. and is open Monday through Friday, 9 a.m.–5 p.m. This online Nocturnes exhibition reveals some of the influences of many of us Bay Area night photographers. One of my photos is featured on the intro page.